Though strong on average, every industry, including chemicals, has weak links. Clued-in credit managers and supply chain analysts know that just one public company in financial trouble can cause massive headaches for your business if not properly evaluated. Vigilant monitoring, via the use of CreditRiskMonitor's proprietary FRISK®️ score, helps to keep subscribers away from public company finance dangers. Employed by more than 35% of companies within the Fortune 1000 and covering more than 58,000 public companies worldwide, the FRISK® score highlights which companies are at higher risk of bankruptcy. The FRISK®️ score provides the first line of defense, regardless of industry health, highlighting financially weak companies. Incorporating stock market capitalization and volatility data, bond agency ratings from Moody’s, Fitch, DBRS and Morningstar Credit Ratings, financial ratios such as the Altman Z”-Score and crowdsourced subscriber behavioral data, the FRISK®️ score blends it all into an easy-to-follow scoring system for public company bankruptcy risk: "10" for the healthiest companies, down to "1" to indicate a company with up to a 50% chance of going bankrupt in the coming 12 months. A score between “5” and “1” on the scale – which we call the FRISK®️ score “red zone" – indicates heightened bankruptcy risk. 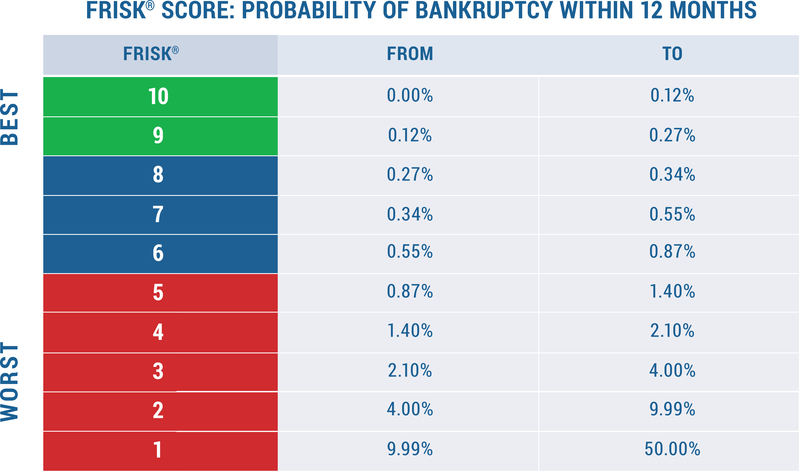 A whopping 96%* of all companies that go bankrupt pass through the red zone prior to filing. These are the companies you need to monitor with regularly immediately, lest you leave yourself exposed to titanic losses. We’ll take a look at three companies in the chemical sector that we believe need to be monitored right now based on their FRISK® scores. As far as performance is concerned, Momentive Performance Materials, Inc. is improving in all areas, albeit slowly. For example, sales have increased steadily over the past year and net income more than doubled year over year in the second quarter. The company’s leverage is still an issue, though, and could cause problems in a contracting economy. Right now, Momentive Performance Materials is facing debt that outweighs equity by more than 200%. Focused on producing different kinds of resins, Hexion, Inc. has held the lowest-possible FRISK®️ score of “1” for more than a full calendar year, implying a chance for bankruptcy of between 10-50% over the next 12 months. The company has lost money in each of the past five fiscal years, with negative net income for the last five sequential quarters. The company also has an issue with free cash flow. Hexion, Inc. has recorded negative free cash flow in three of the last five sequential quarters and in four of the past five fiscal years as a whole. Leverage is an additional headwind, with the company's total debt-to-assets ratio at 180%. Further, tangible net worth is negative, as is stockholder equity. Weak earnings and cash flow on top of a highly leveraged balance sheet could lead to disaster. In the business of producing specialty hydrocarbon products, Calumet Specialty Products Partners, L.P has bounced between FRISK®️ scores of “1” and “2” for the past 12 months. Like the aforementioned companies above, Calumet has some serious performance and leverage issues contributing to the low score. Calumet has some serious performance and leverage issues contributing to the low FRISK® score. For starters, Calumet has lost money for four consecutive years. It is in the red through the first half of 2018, as well. Free cash flow, meanwhile, was negative in four of the past five years and through the first half of this year. At the same time, leverage has become an increasing concern, with total debt-to-assets rising from 41% in 2013 to 75% in the second quarter of 2018. In a contracting economy, Calumet could find it difficult to keep its head above water. Financially weak companies are present in every industry, even the best-performing ones. In order to stay ahead of risk, companies must have intuitive, forward-looking tools at their disposal. Having a tool like the FRISK®️ score to provide an accurate, real-time look at a company’s financial health is vital to mitigating risk and preventing loss. You should be closely monitoring Momentive Performance Materials, Hexion, Inc. and Calumet Specialty Products Partners, L.P if they are your financial counterparties. These companies could cause delivery delays for customers, financial losses for suppliers and complex bankruptcy proceedings if they should continue on a downward financial path. Companies like the above-mentioned chemical names could cause problems in the way of delivery delays for customers, financial losses for suppliers and lengthy, complicated bankruptcy proceedings if they should continue upon a downward path.